Embroidery hoops might seem like a simple craft material, but did you know just how many craft projects you can use them in? Thankfully, the humble little hoop has a wide array of fun uses, all of which can easily be achieved within a weekend! We’ve rounded-up 45 amazing DIY projects which you can create using the material, whether it’s embroidery crafts, wall hangings, artworks, ornaments, or other stunning home decor. It’s time to get a needle, some thread, and plenty of glue – Let’s dive in! Using affordable embroidery hoops, you too can create these beautiful fairy light decorations, just as A Bubbly Life has done! They look great when made from a variety of sizes. A Bubbly Life is one very talented blogger! She’s actually created these beautiful, bohemian-inspired tambourines using embroidery hoops. These DIY monogram embroidery hoop decorations from Adventures in Making serve as the perfect gift for a loved one! You can check out the full tutorial to see how they were made. AKA Design has created these wonderfully cheap embroidery hoop orbs – Aren’t they great? They actually look like something from a high-end, luxury home store. We love these eye-catching and vibrant DIY embroidery hoop decorations from Alice and Lois! You’ll be pleased to know that you too can re-create these wonders. Here’s a DIY embroidery hoop project that your children can get involved in! Artful Parent has created a tutorial for these beautiful and crafty sun catchers. These simple DIY embroidery hoop gifts from Classy Clutter are the perfect present choice for many of your loved ones, whether it be for their birthday or Christmas. You’ll love the step-by-step tutorial too! Here’s a DIY Halloween project that you can easily make using embroidery hoops. Consumer Crafts will teach you how to create this scribble cat art – Amazing! Consumer Crafts will teach you how to create an easy, round weaving loom using an embroidery hoop. This is a fantastic project to tackle this weekend! One of the very basic skills of using embroidery hoops is knowing how to correctly finish one. Thankfully, Daisies for Violet will teach you how with her step-by-step tutorial! This DIY watercolor mini hoop art from Darice is not only incredibly eye-catching, it’s also super easy to create! You can even mix and match your own design with various watercolor patterns. How’s this for a handy little wall storage unit? DIY Candy will show you how to create this colorful and funky embroidery hoop wall art. Is there anything you can’t do with an embroidery hoop? Dwell Beautiful will even show you how to create a hanging mobile using the cheap craft item! Here’s a wreath with a difference! 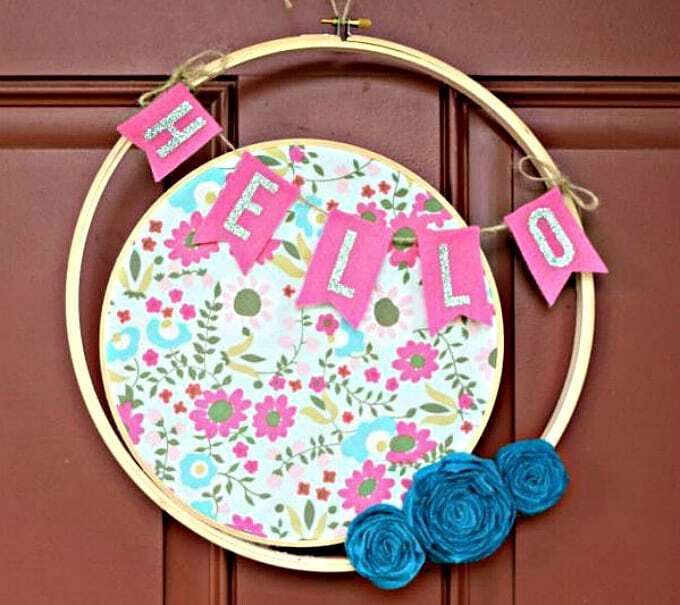 Dwelling in Happiness will teach you how to create this crafty and cute embroidery hoop art. It’s perfect for hanging on your door! You can even make a more traditional wreath using an embroidery hoop, just like this one from Ella Claire Inspired. The best part is that it’s probably one of the cheapest wreaths you’ll ever make! Enthralling Gumption will teach you how you can also create a beautiful and very on-trend woven wall hanging using embroidery hoops. Too easy! How beautiful is this embroidery hoop design from Flamingo Toes? Thanks to the blogger’s template and tutorial, you too can create this within just one afternoon! We love these DIY Christmas embroidery hoop decorations from Flamingo Toes! Not only are they very easy to make, but they’re also incredibly eye-catching when hanging on a Christmas tree. Embroidery hoop projects can be made all-year-round and Flamingo Toes shows us how you can also incorporate them into your Halloween crafts. Your children will love these! These denim pocket organizers from Homemade Modern Blog are a genius idea! Not only do they turn your old jeans into something crafty, but they also use the humble embroidery hoop. Fancy making some DIY constellation embroidery hoop art? We think guests will be amazed by your craft skills when they spot these hanging on your wall! Honey and Fitz will show you how it’s done. Can you believe that you can even create a DIY clock using an embroidery hoop? Thankfully, Hunting for Ladybugs has a full tutorial for you via Mums Take 5. Forget your traditional gallery wall – this DIY embroidery hoop art wall from Lady by the Bay is way better! Find out how you too can create this in your home by following her tutorial. Lilla Bjorn Crochet will generously teach you how to easily turn embroidery hoops with crochet border into frames for pictures. The options are endless with this one! Isn’t this handy? Little Red Window has created a DIY embroidery hoop pocket using easy-to-find materials and you can too! Be sure to check out her tutorial. This is the ultimate thrifty project from Make It & Love It. She’s created a DIY wreath using thrifted brooches and embroidery hoops – they look stunning! Have you ever wondered how to crochet around an embroidery hoop? Luckily for you, MakeZine has a tutorial to help you learn exactly how! Wow, this DIY embroidery hoop clock from Melly Sews is gorgeous! Mix and match your own favorite fabric for a look that’s completely unique. This summer air plant wreath from Oh So Beautiful Paper is a cheap and easy decoration alternative for parties, weddings, baby showers – you name it! These embroidery hoops from One Krieger Chick hold photos of your near and dear – isn’t that wonderful? They’re also now as tricky as they look to create! Polka Dot Chair has created some adorable DIY embroidery hoop cat Christmas ornaments. You’re sure to have a blast creating these! Creating embroidery hoop wall art needn’t be difficult – just check out R & R Workshop’s easy-to-follow tutorial to get started! This DIY fall embroidery hoop wreath contains an alluring orange chevron pattern and monogram design. Reasons to Come Home has the full tutorial for you! We think that this embroidery ring sun catcher idea from Red Leaf Style is perfect! Not only does it cost just a few dollars to make, but it also features some gorgeous foliage that you can collect from your own yard. Here’s another DIY embroidery hoop Christmas ornament you can create to add some much-needed festive cheer to your tree. Remodelando la Casa has used beautiful lace in this project. Sadie Seasongoods will show you how to create your very own fun Halloween spider web using an embroidery hoop and crochet. Children and adults alike are going to love this one! Here’s another DIY embroidery hoop project which is perfect for Halloween! Sadie’s Season Goods will show you how it’s done. Isn’t this DIY embroidery hoop project from Sarah Hearts stunning? It’s the perfect gift to spoil your mom with this Mother’s Day! Need somewhere fancy to store your craft materials? Why not make this awesome embroidery hoop pouch from Sew Delicious? You can even hang it on your wall for easy accessibility. These embroidery hoop pin boards from The Casual Craftlete are just what every office needs! Not only are they functional, but they’re extremely pretty too. Create a DIY embroidery hoop baby mobile by following this great tutorial from The Enchanting Rose. We think it’s a great idea for a nursery or baby shower gift! This lovely DIY project from The Glamorous Housewife involves printing your favorite portraits on fabric, fixing them to an embroidery hoop, then embroidering some fun elements on the photos. Now isn’t that clever? These DIY mini embroidery hoop ornaments from The Graphics Fairy are super adorable – we love the bunny art inside of them! The gold glitter-dipped edges makes them extra festive too. Did you know that you can also use embroidery hoops as DIY looms for weaving? Here’s another helpful tutorial from the talented The Weaving Loom. You can also make a large fabric pouch using an embroidery hoop, just as Yellow Pillows has done. It’s perfect for storing all sorts of bits n’ bobs! There you have it – 45 amazing DIY embroidery hoop projects that you can whip-up within a weekend! Which ones were your favorites? We’d love to hear from you in the comments section below! Wow, there are a lot of great crafts to make with an embroidery hoop. I’ve marked a few I would like to try. Thank you for including mine in your list too! Wow! There are so many beautiful and creative embroidery hoop ideas. Thank you for sharing these talented crafters with us and a big thanks for including my embroidery hoop mobile…I am honored!